What do I get in the Selling options – Ultimate, Premium and Essentials - to sell my home privately? Do I need any legal advice if I am selling my house or property privately? Yes you do. Agent In A Box is a marketing and support group. We cannot offer any specific legal advice, and our support is based on integrity and ethical dealings with ALL sellers and buyers. All the bases are covered for you from preparing and listing your home to helping you close a deal. Always remember that you are at complete liberty to sell your own home! Before you list your home, always seek the services of a Legal Property Practitioner (lawyer / conveyancer) to find out if you have any legal obligations to carry out before offering your home to the market. (Each Australian State and Territory has slightly varying laws for property transactions). Also that same Legal Advisor will assist in contracts and supporting documents when you strike a deal with your buyer. We provide guides for obtaining relevant details to pass onto your Legal Advisor. How much money will I save if I am selling my house “for sale by owner”, through Agent in a Box? The average Agents commission in Australia is around 2.3% of the sale price of a home. Say the average Australian home is worth $650,000, a traditional Agent’s commission for a completed sale would be almost $15,000 plus marketing costs which may include: Photography, print media, property websites, signage, brochures……this could range from an additional $2,000-$5,000 dependent on how well your agent sells his marketing packages. Conservative sale cost could be around $18,000 on a $650,000 home. For the same result, a sale for a premium price through the support and marketing exposure of Agent in a Box…..$699. In this example the saving is 96%. How long does my property stay listed on realestate.com.au and the other sites when selling my own home through Agent in a Box? Why is your service so cheap? What's wrong with it? There is nothing wrong with it. It works! In the 4+ years we have been operating, we've assisted over 1,000 Australian home and property owners to sell, and, as we speak, saved them almost $16,000,000 in commission. Cheap? It's basic maths. Each year, Australia wide, about 400,000-500,000 homes and properties turn over. Our specialised system allows ANY home owner to create their own listing and promote it on the BIG websites, then deal directly with buyers with our support and advice (and the buyers love it!). So, it comes down to volume and operating online, plus we have low overheads. The system is the compilation and sharing of over 30 years of combined, front line Real Estate sales experience without the BS. My home is in suburb 'Y' but I think buyers know suburb 'X' better. Can I list my home for sale in the 'better known' suburb? In a nutshell, no. The listing sites are very strict on accuracy of the true location of any property put up for sale. We strictly adhere to the guidelines laid down by the listing sites and insist on accuracy of location from our members. How will buyers find my property if I am selling privately? Buyers search via one of Man’s most revolutionary advancements since the car, TV and flight……The Internet. It is extremely likely that realestate.com.au or Domain.com.au IS where potential buyers are going to find your home or property, that is why you are listed there as an Agent in a Box member. To enhance your exposure, your home or property is also listed on other economical, well visited sites such as thehompage.com.au, realestate1.net.au and more. Signage plays a part to help identify to your home to buyers driving around an area looking for signs or confirming that your property is indeed the one they have identified on the Internet as being of interest. Print media is shrinking in its buyer pulling power and spread. Buyers have flocked and are still flocking to search for property online. You may choose to place a small ad in the property section of your local newspaper, especially if you decide to invite buyers to attend an 'open for inspection' at your property. All your marketing/advertising bases are covered with Agent in a Box. So how do buyers contact me? Buyers follow property not agents! Why? Because 90%-95% of all buyers searches and enquiries are conducted online Once a potential buyer sees and is attracted to your home or property they will call or email the entity/company representing your listing, in this case Agent in a Box. That call or email is passed straight onto you via email or sms (your choice). We keep a database of all these enquiries on your behalf in case you misplace any enquiry. 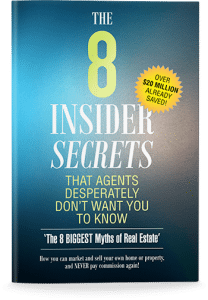 Don’t Agents have exclusive access to nearly all the buyers? A HUGE myth! No they don’t. Please see The Eight Biggest Real Estate Myths. This and many other misconceptions about Agents and selling are dispelled. HINT: Buyers rarely even go into real estate offices anymore looking for property or homes. Where do you think buyers find their next home? See the Eight Biggest Real Estate Myths to find out. Can I list more than one of my properties for sale by owner on Agent in a Box? Yes, you can list more than one property as long as you are the titled owner, as is the case with all listings. If you are an 'Ultimate Member' ($699), subsequent listings are $599; 'Premium Members' ($499) next listings are $449; and 'Essentials Members' ($329) next listings are $299. ALSO: We know that sometimes life gets in the way and you may need to take your property off the market for a short time. We allow one four week 'rest period' during the time your property is on the market. Should you require a period longer than four weeks, a re-list fee is applicable of $299 for all options. How long does it take for my property/home to be seen on the websites once I upload it? Does Agent in a Box only work best on selling homes of a lesser value? Not at all. These proven philosophies, teachings and support are applicable and can succeed anywhere, on any type of home in any price range. The key to selling ANY home is understanding that buyers search, react and behave in exactly the same ways during the home buying process, no matter if the home in question is a $4 million Vaucluse mansion or a $300,000 cottage in Ipswich. It is this understanding that makes Agent in a Box such a simple yet powerful home selling option. We understand that this innovative and simple method of selling your home or property may not be for everyone. There will still be home owners who are drawn to the services of traditional agents and are prepared to pay the commissions and fees required. We sincerely wish you well. However, for those of you who utilise Agent in a Box and the Owner Direct Online System, this decision will pay off in spades with enormous rewards and satisfaction. I’m not a sales person. Can I sell my own house/property privately, without an agent? You don’t have to be. You are purely offering your home to the buying market for a stated price and you are going to assist a buyer in making their own mind up to decide whether your home represents good value and it suits their needs. HINT: Buyers hate to be sold to, but they love to buy. You are there to help. To privately sell a house seems complicated and time consuming. Is that the case? It’s not. We have broken down the process into SIX simple to follow Phases, the Owner Direct Online system. From Pricing to Closing The Deal, this is a series of videos and teachings that are easy to learn and implement. As a member (Ultimate Promotion, Instruction, Support) you can view them over and over. Each phase covers the sale process so simply, that a ten year old child could engage buyers, show a home and deliver a sale. We have designed the Owner Direct Online system to give you the control and confidence to enjoy and reap the benefits and rewards of selling your own home. Does it matter what type of market I am selling in? Not really. There are only three types of markets: Seller’s Market – More Buyers than Properties, Prices Rising, Homes Selling Relatively Quickly. Multiple buyers showing interest on individual homes. Even Market – Steady as she goes. Enough buyers for the amount of homes on the market. Prices stable. Buyers still believe they have time and choice on their side. Homes take a little longer to sell. Usually a transitional period from cold (buyers) to hot (sellers) market. Buyer’s Market - Less buyers than there are homes for sale. Buyers take their time. May come in and out of the market resulting in low demand. Uncertainty due to negative media and economic factors. Prices falling. Homes taking much longer to sell. Regardless of which market you might be selling your home in, the market (buyers) ultimately determine the price of your home. Always prepare, price and promote your home well and the buyers will come. How do I price my property to attract buyers, whilst not underselling it? The AIAB Owner Direct Online System covers this in Phase 1, Pricing. There are some basic rules to follow and tasks to undertake. Ultimately it is your decision and the market (buyers) will tell you very quickly whether you have hit the ‘sweet spot’ or not. Here’s a BIG hint; The longer a home is overpriced the longer it will take to sell and the ultimate sale price could look very average indeed. How do I know if my home looks good enough to buy? Phase 2, Presentation, of the ODO system covers this. Presentation is really about common sense. AIAB covers this topic quite comprehensively. The key elements are; de-clutter, clean, tidy and smells fresh. You only have to watch a show like Selling Houses Australia to get an idea of how important presentation is. Some of their make-overs are quite extreme, however the principle is the same everywhere; clean and tidy, inside and out, puts a smile on a buyer’s face and eventually yours. The electronic and print media is awash with tips on preparing and presenting your home for sale. A buyer’s reaction can tell you straight away if your home is attractive or repellent. How many photos can I upload to my listing and what size should they be? Twenty Four (24) images. In most cases around 12-18 shots are plenty, but if you have more, that is fine. Make sure they are in landscape orientation (horizontal) and not bigger than 2MB each. I don’t know how to write a story about my home. Phase 3, Promotion. You can follow the proven and effective Agent In A Box ‘Narrative Template’. Remember, keep it simple, to the point, and don’t write War & Peace or a boring inventory list. My house is ready, I know the price I want, the story is written and the photos are taken. What do I do now? Phase 3, Promotion. Simply click on any of the website 'Sell It Yourself Now' or 'List Now' icons and just follow the prompts. It takes only a few minutes and your home is blasted out to almost the entire market within a couple of hours. Your home appears on Australia’s most visited property websites. Change narrative to: Simply head to the pricing page (link) click on 'list now' and follow the bouncing ball to sign up, pay for your package and start creating your listing. Submit it for approval – and before you know it, it is in front of eager buyers on all the BIG websites. (We'll also be in touch to arrange your signage). How often can I change something on my listing? What sort of property can I sell through Agent in a Box? We specialise in assisting owners to sell all types of residential property: Houses, Units, Villas, Land and Acreage Property. You can also choose to advertise your property for rent as well. I’m on the market. A buyer calls or I have a message to contact a buyer. What do I do? Phase 4. Talking to Buyers. The ODO system covers fully and simply how to talk with a buyer and quickly understand whether he or she CAN actually buy your home - how interested they actually are. You’ll learn how to talk comfortably with buyers and set appointments to suit both you and the buyer. An Agent called to say he has a buyer, but wants a commission to introduce the buyer. I am keen to stick to the 'sell your own home' method. What should I do? This is ‘Standard Operating Procedure’ for some Agents. Always remember this extremely important and accurate fact – Buyers follow property, NOT agents. No Agent owns a buyer. ANY and EVERY buyer looking in your price range and locality or suburb are seeing your property via the marketing you have undertaken online. They will enquire directly with you or through AIAB, who will immediately pass on the buyer’s details to you. Simply thank that Agent for his interest and let him know you have it all under control. We guarantee that buyer, if he or she exists, will come to you if they have a serious interest in your property. A buyer is coming over to look, what do I say? How do I show them the home so they see everything and like it? Phase 5. Engaging Buyers. First and foremost, make sure the home is looking its absolute best. Here the ODO system covers what to ask and say when the buyers arrive to inspect the home. How to conduct a ‘buyer friendly’ inspection. How to read some body language and understand ‘buyer-speak’. Also what to ask when the inspection is done. HINT: Your creator gave you two ears and one mouth for a reason? What is it? Phase 5 will give you the answer and why is it critically important to the sale of your home. A buyer who saw my property called and asked what I will take for it. What should I do??? Phase 6, Negotiation and Closing, has got you covered. We understand that stress levels and emotion can kick in when this event occurs. We call this the ‘Sharp End’, everything you have done and mastered until now has led to this momentous event, an offer! First of all, don’t panic. Take your time to listen and think. Phase 6 will have you negotiating like a pro and setting up the most favourable of all deals – a win/win outcome. HINT: Negotiation is like a game of tennis that crowns two winners. My home has been on the market for a few weeks and I have not had many enquiries or buyers come to look. What do I need to do? Always revisit the Three ‘P’s, Promotion, Presentation and Price. They are the ONLY three adjustable factors, which you control, and that you can change to make your home more attractive to buyers. There are few tweaks that can be made that may help bring buyers in, but in the majority of cases, Price, or lack of perceived value, is the factor that keeps most buyers from enquiring and inspecting a home. Your value may not be to the market’s liking. AIAB covers these scenarios in Phases, 1, 2 & 3. Should you still be concerned about a lack of interest or any other important issue, as an AIAB seller, you can contact us and your question will be answered promptly and clearly. The key to your success is following the easy to understand the Agent in a Box, Owner Direct Online System and enjoying the process along the way. This is the Smarter, Simpler, Cheaper way to sell your home for a premium price. Can I display my phone number and/or email address on my listing on realestate.com.au and domain.com.au? In a nutshell – no. No seller, whether with a DIY or traditional agent, can have their personal details displayed anywhere on their listing. This is set down in the terms of engagement all agents have with these property portals. Brilliant! From start to finish the whole process is so easy. Agent In A Box give you absolutely everything and more you need to be successful, and are always only a phone call or email away for advice. Couldn't recommend them enough! !